Manny Fernandez, managing partner of KPMG's Dallas office, will be the spring 2017 speaker for the K-State College of Business Administration's Diversity Lecture Series. The lecture will begin at 1:30 p.m. Wednesday, Jan. 25, in the Business Building lecture hall. The event is free and open to the public. Fernandez is an audit partner with 33 years of experience in multiple industries, and has worked with domestic, foreign, public and private companies throughout his career. As the managing partner of KPMG's Dallas office, Fernandez represents the firm in the local marketplace and business community. He is responsible for the development and retention of key resources, and works with approximately 100 partners and 1,000 professionals to deliver on KPMG's commitment to provide quality client service. 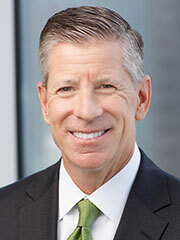 He previously served as partner in charge of KPMG's Audit and Risk Advisory practice for Colorado, and as national managing partner for University Relations and Recruiting. He also worked in KPMG's Mexico City office for three years, serving many of the firm's multinational clients as well as Mexican companies filing in the U.S.
Fernandez currently serves on the boards of the Boys Scouts Circle Ten Council, the American Heart Association-Dallas, the Dallas Regional Chamber, the Dallas Citizens Council and the United Way of Metropolitan Dallas as an Alexis de Tocqueville Society member. He also is a member of the Association of Latino Professionals in Finance and Accounting and a member of KPMG's National Diversity Advisory Board. He and his wife, Debbie, have two children, Maggie and Ben.